The first meeting of the project Global Sustainability Strategy Forum (GSSF), organised by the IASS and Arizona State University, and sponsored by the Volkswagen Foundation, brought together fifteen renowned experts in the field of sustainable development from around the world, among them GCF chairperson Carlo Jaeger. The scientists gathered in Potsdam for one week to discuss the state of play and the need for action to support the implementation of the United Nations’ Sustainable Development Goals around the world. Their deliberations have resulted in new insights and recommendations to improve policymaking for sustainable development. For more information please visit IASS‘ news entry here. For audio-visual impressions of the Forum there is a short video available on youtube. Researchers from GCF (Adaptation and Social Learning research process) contributed to a recent OECD report “Responding to Rising Seas OECD Country Approaches to Tackling Coastal Risks”, including leading a chapter analysing the future costs of sea-level rise and adaptation measure in the 21st century. The report reviews how OECD countries can use their national adaptation planning processes to respond to this challenge and examines how countries approach shared costs and responsibilities for coastal risk management and how this encourages or hinders risk-reduction behaviour by households, businesses and different levels of government. The report further outlines policy tools that national governments can use to encourage an efficient, effective and equitable response to ongoing coastal change. It is informed by new analysis on the future costs of sea-level rise, and the main findings from four case studies (Canada, Germany, New Zealand and the United Kingdom). Here are the links to the Report and coastal chapter. Researchers from GCF (Adaptation and Social Learning research process) contributed to a recent World Bank report on global infrastructure investments. They provided the chapter in coastal protection infrastructure needs under different socio-economic and climate scenarios. Failure to secure the appropriate financial tools, institutions, and governance mechanisms to ensure maintenance – and thus continuous protection over time – would increase risk and could result in catastrophic failures. Absent a firm commitment to reliable maintenance, a combination of nature-based protection, land-use planning, and retreat should be favored. 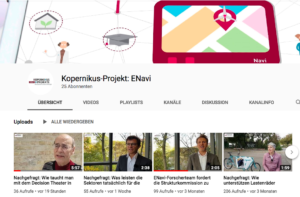 IASS, as the coordination office of the Kopernikus Project Energy Transition Navigation System (ENavi // more here), has launched a short film on GCF’s activities in the context of the Forum’s Mobile Decision Theater event held at Haus der Kulturen der Welt on 28 November 2018. Tagesspiegel author Susanne Ehlerding gives a thoughtful insight on what climate models can and cannot do, and how the Decision Theater of GCF contributes to developing models interactively between scientists and stakeholders so that models can serve as practically useful guidance aids. Finance plays a key role in successfully achieving the objectives of the Paris Agreement (Article 2.1.c: aligning financial flows with the Paris Agreement).